This paper proposes an energy-efficient, high-throughput DRAM architecture for GPUs and throughput processors. In these systems, requests from thousands of concurrent threads compete for a limited number of DRAM row buffers. As a result, only a fraction of the data fetched into a row buffer is used, leading to significant energy overheads. Our proposed DRAM architecture exploits the hierarchical organization of a DRAM bank to reduce the minimum row activation granularity. To avoid significant incremental area with this approach, we must partition the DRAM datapath into a number of semi-independent subchannels. These narrow subchannels increase data toggling energy which we mitigate using a static data reordering scheme designed to lower the toggle rate. This design has 35% lower energy consumption than a die-stacked DRAM with 2.6% area overhead. 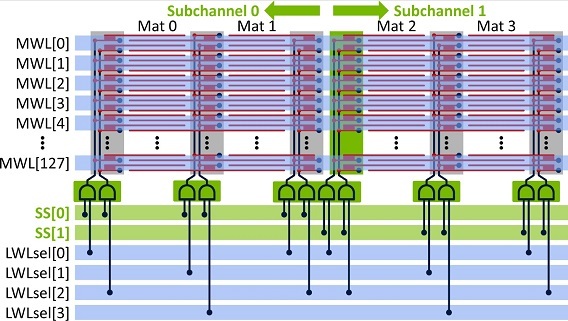 The resulting architecture, when augmented with an improved memory access protocol, can support parallel operations across the semi-independent subchannels, thereby improving system performance by 13% on average for a range of workloads.